Lenovo Philippines recently held an event to launch their new newest ultraportable flagship, the Lenovo X1. Designed for business users who demand the best in performance but need the extra mobility, the 13.3” laptop is the perfect portable powerhouse to bring to the boardroom. Hailed as the company’s thinnest business laptop, the device still brings to the table some of the most revered durability features we’ve seen to date. It has an edge-to-edge gorilla glass display, military spec reliability, metal rollcages, drop sensors, spill resistant keyboards, RapidCharge battery as well as RapidBoot SSD drives, and various other features that only Lenovo can bring. Powered by Intel’s newest 2nd generation Core processors, the Lenovo X1 can be had for a price starting at PHP 120k from Lenovo. The Lenovo X1 continues the flagship line of the company’s business laptops – but iterates on the design and improves it in every which way. Of course, the ThinkPad durability and performance should be well expected – as you can even see their older siblings the IBM ThinkPads still being used today. (IBM handed over PC/laptop manufacturing to Lenovo some 5 years ago.) Since then, they’ve beefed up the tech and design, durability and portability. The X1 is now 17mm thin and 3.7lbs, but manages to pack Intel Core chips inside (i3, i5, i7) – a feature that only larger notebooks of 14”-15” units have. Durability-wise, it has your ThinkPad “built like a tank” look and feel, with metal rollcages for damage prevention, gorilla glass display, spill resistant keyboard, and overall high quality materials and build quality. Finally, the X1 passes eight military specifications for use in harsh environments with guaranteed performance. Rounding out the features include Lenovo’s patented technologies that improve the usability and practicality of the device. A RapidCharge battery is built into the device and is rated for up to 1,000 battery cycles that lasts three years. More importantly, the battery technology charges 2.5 faster than a typical ThinkPad battery, allowing the battery to get up to 80% juice in just 30 minutes. RapidDrive SSDs, combined with Lenovo’s Enhanced Experience 2.0 also provide faster bootup and access times for improved performance. A Dolby Home Theatre sound system is also included and a 350 NIT bright HD display performs all the entertainment functions that you need. Finally, being a business oriented device, there are options for 720p video camera, high definition noise cancelling microphones, advanced video call modes and robust layers of security – including Intel vPro, encrypted hard drives, and a fingerprint security system. 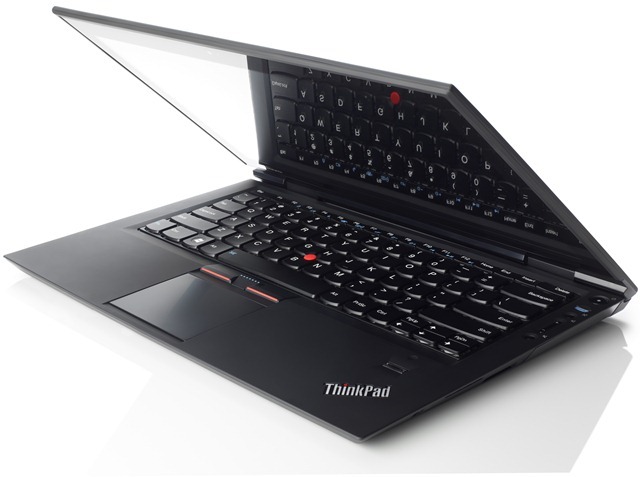 The Lenovo ThinkPad X1 notebook is available through Lenovo’s business partners and it starts at PHP 120,000. For a quick video tour of the device (and a bonus USB-powered Lenovo portable LCD), watch Mr. Wee Liam So, Technical Manager for ASEAN for Lenovo below. For more pictures of the event, check out our gallery below.